It hasn’t been that long since I first played the demo for Wandersong at PAX West earlier this month. While I enjoyed what I played, I mentioned that the game’s staying power would primarily depend on the diversity in its world and puzzle design, considering the relatively simple core mechanic and story. Fortunately, diversity is something this game possesses in spades in its world, characters and puzzles. 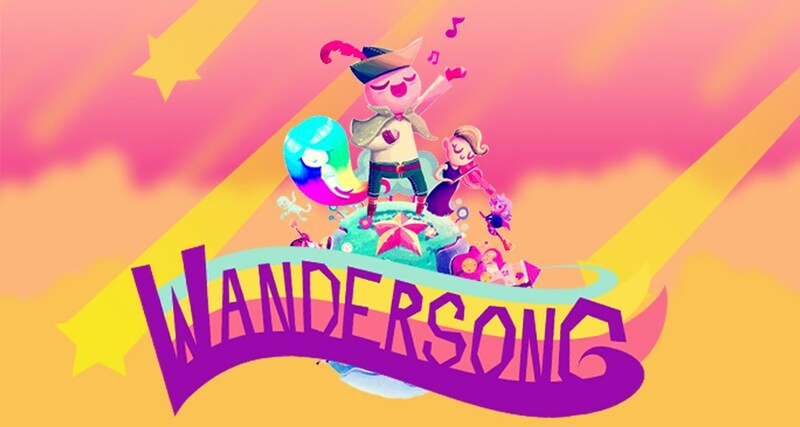 Wandersong follows a bard on an adventure to claim the parts of the Earthsong from the seven Overseers throughout the world in order to prevent the creator god from ending the world and creating a new one. The bard is joined on his journey by the irritable witch Miriam, and meets many other unique and varied characters throughout his journey. The world itself is brightly-colored and diverse, with each area possessing its own unique feel and palette, along with the characters you meet in each place. Each region houses one of the different elemental Overseers (which represent dreams, wind, chaos, order, the sun, the moon, and heart), and once you claim their part of the Earthsong you can’t go back to an area, something I unfortunately didn’t realize until after I left one of the areas without fully exploring it. The bard himself is actually one of my favourite characters in this game. 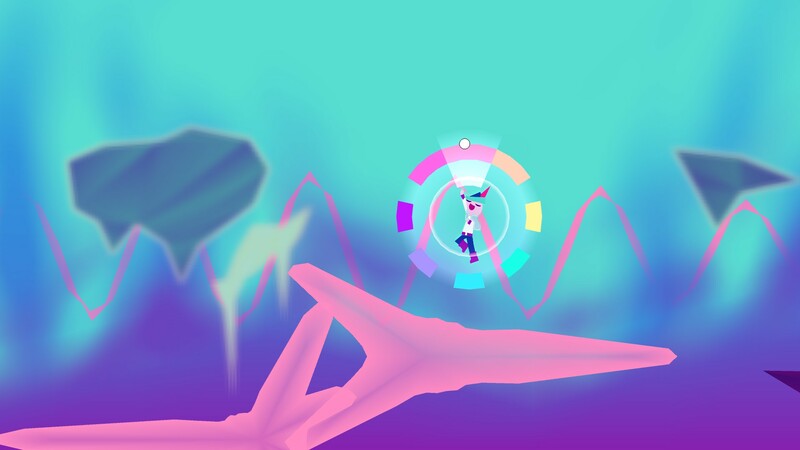 The primary mechanic in Wandersong is the bard’s singing, which is done for everything such as composing and singing songs, solving puzzles, choosing dialogue options in conversations, and other things. Generally, everything that can’t be solved by jumping or simple interaction requires singing in some way. The bard can sing eight notes, notated by different directions and colours, which are both used to show puzzles and let the player know how to solve them. The notes themselves change slightly to match the key of the area’s background music, and the hues used to signify them change to match the area’s design. While singing, the environment moves to the beat of the music, and certain elements such as leaves and flowers change to match the notes you sing. It’s nice attention to detail, and helps make the world feel alive and vibrant. 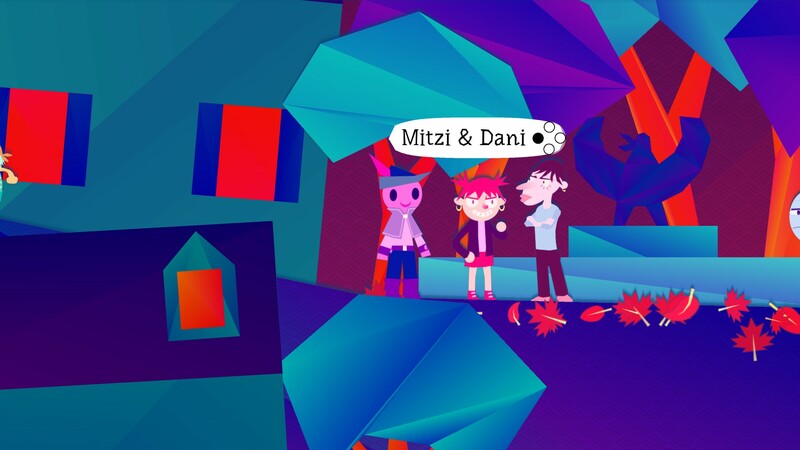 Wandersong does a good job of humanizing its characters and world, especially the bard and Miriam as they develop and grow as people, and as friends, throughout their adventure. A particular highlight in the game for me was a heart-to-heart the two have at one point late in the story, as Miriam contemplates her identity as a witch while the bard talks about trying to stay positive, even as everything seems to be falling apart around them. It helped the characters feel more complete, and illustrates the kind of effort Wandersong puts into its characterization and personal arcs. The spirit world areas are beautiful and otherworldly. Wandersong has striking and pleasing visuals, with a colourful paper cutout style and environments stacked up into the background, so you can go behind some scenery as you ascend through an area, and lots of unusual angles for the ground. The visuals remind me of the Paper Mario games, as does the way the dialogue is shown. Each character has their own font, and the text can move in different ways along with the timing with which it appears to help convey tone. It’s another thing that gives more personality to the characters and makes everything seem more alive. The spirit world areas where the overseers live are even more striking, with otherworldly colors and designs setting them apart from the regular world and making them a real treat to see. The general structure is pretty standard adventure game fare, with the player doing various things for the locals in each area to learn the area’s Song of the Overseer, so they can go to the spirit world and learn the area’s part of the Earthsong. Things change gradually as the game progresses, but the majority of the game involves helping each area’s inhabitants. Some of these things you do to get the Songs of the Overseers involve getting a local band back together, helping coffee-selling pirates find mermaids, helping a bridge troll lift a curse placed on his boyfriend, and ending a generations-long war between two nations, among other things. These two are pretty par for the course for the characters you’ll meet. 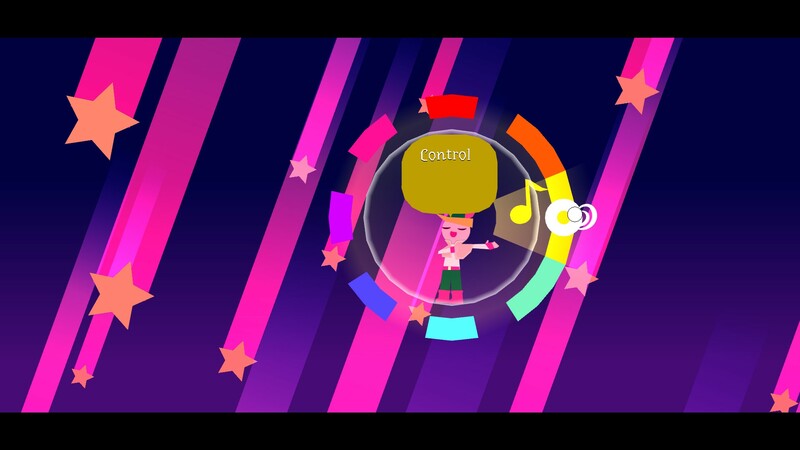 The music, as one might expect from a music-centric game, is solid. It suits the areas well, and in a nice extra touch the key of the bard’s singing changes to match the key of the background music. You can also dance, and you can find extra dances to do as you thoroughly explore the world, although the dances have no in-game function aside from just being a fun thing to collect. Unfortunately there’s not much else to do beyond the main story and finding the dances, so there’s not much to do after you finish the main story, but there’s a decent amount to the main plot itself so that’s not a huge problem. 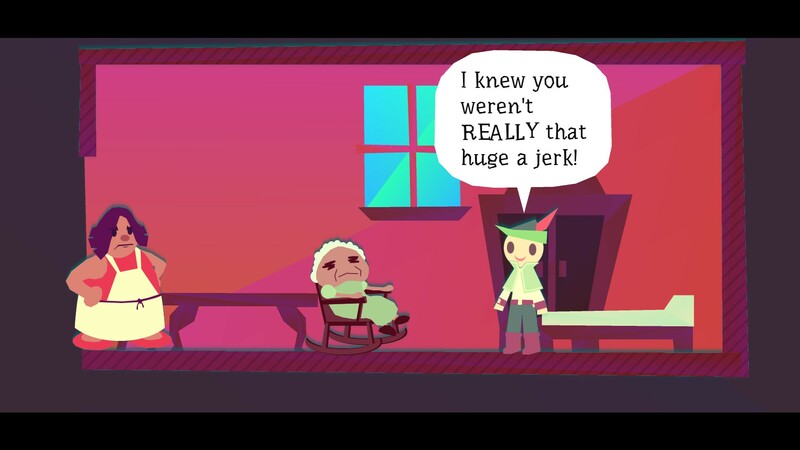 Wandersong is a pleasant game for the most part, but knows to get serious when the situation calls for it. It makes good use of its fairly simple core mechanic of singing, with a nice variety of puzzles to solve as you progress. I like the various ways it uses music, as a way to communicate, for concerts, and as a tool to solve puzzles, as you meet and help the diverse cast of characters throughout the world. It’s available on both Switch and PC; I played the PC version for this review and the Switch version at PAX. I personally prefer mouse and keyboard, since I find the mouse easier for singing than the right stick, but both styles seem fine. The adventure is about 10 hours long, and is enjoyable throughout for $20 USD. Although completing the game unlocks a scene select function to go back and replay scenes, there’s not much to do beyond that. Even so, it’s a cute game with fun characters and well-designed puzzles, and I think fans of adventure games will find a lot to love with Wandersong. Sing your messages to the world when talking doesn’t cut it.